Public-health benefits of controversial research questioned. Why would scientists deliberately create a form of the H5N1 avian influenza virus that is probably highly transmissible in humans? In the growing debate about research that has done precisely that, a key question is whether the public-health benefits of the work outweigh the risks of a potential pandemic if the virus escaped from the lab. For the scientists who have created the mutated strains of the H5N1 virus, the justifications are clear. Surveillance of flu viruses could, they argue, allow health organizations to monitor birds and other animals for the mutations that would provide an early warning of a pandemic and enable authorities to act quickly to contain the virus. That claim is meeting with scepticism, however. More than a dozen flu experts contacted by Nature say they believe that the work opens up important vistas in basic research, and that it sends a valuable warning about the potential for the virus to spark a human pandemic. But they caution that virus surveillance systems are ill-equipped to detect such mutations arising in flu viruses. As such, work on the viruses is unlikely to offer significant, immediate public-health benefits, they say. That tips the balance of risk–benefit assessment in favour of a cautious approach, says Michael Osterholm, who heads the University of Minnesota’s Center for Infectious Disease Research and Policy in Minneapolis, and who is a member of the US National Science Advisory Board for Biosecurity (NSABB). In a paper submitted to Science, Ron Fouchier’s team at Erasmus Medical Center in Rotterdam, the Netherlands, found that just five mutations allowed avian H5N1 to spread easily among ferrets, which are a good proxy for how flu behaves in other mammals, including humans. All five mutations have been spotted individually — although not together — in wild viruses. Yoshihiro Kawaoka of the University of Wisconsin-Madison and his colleagues have submitted similar work to Nature, which is partially described in an online Comment published this week. Acting on advice from the NSABB, the US government last month asked Science and Nature to publish only the broad conclusions of the two studies, and not to reveal the scientific details, in order to limit the risk that uncontrolled proliferation of such research might lead to accidental or intentional release of similar mutant viruses. The journals and the authors have agreed to this redaction, provided that a mechanism is established to disseminate the data to flu researchers and public-health officials on a need-to-know basis. The US government, the World Health Organization (WHO) and other bodies are now trying to put this mechanism together, along with a framework for inter­national oversight of such research. Last week, in a statement jointly published in Nature and Science, 39 flu researchers declared a 60-day pause in the creation of lab mutant strains of the H5N1 avian flu virus. The hiatus, they hope, should give scientists and policy-makers time to debate how such research might best proceed, and what safety measures should be required of labs that handle the virus. The signatories to the statement, including the key authors behind the controversial research, plan to bring together some 50 experts at a WHO-hosted meeting in Geneva, Switzerland, next month to discuss these thorny issues. Scientists contacted by Nature say that basic research on such mutated strains may eventually yield insight relevant to developing pandemic countermeasures such as drugs and vaccines. And they all agree that the new research has done the world a service by showing that H5N1 seems capable of evolving the ability to spread rapidly among humans, in contrast to what some scientists have claimed. Fouchier’s study “raises a red flag”, says Ilaria Capua, an animal-flu expert at the Experimental Animal Health Care Institute of Venice in Legnaro, Italy. “That is the real, and most important message, of this whole exercise.” It should prompt donors and international organizations to ramp up their funding of efforts to control outbreaks of the H5N1 virus in poultry, and so give the virus fewer opportunities to evolve into a human pathogen, she says. Other scientists add that it should force governments to rethink existing vaccine technologies, which are only capable of supplying vaccine six months after a pandemic starts, and of producing enough vaccine for a small fraction of the world population. But the notion that the research offers a guide to dangerous variants that could be stamped out before they spread is unrealistic, say Osterholm and other researchers. “In order to even consider the possibility of reducing the animal reservoir of an emerging pandemic virus, one would need rapid and complete detection of virus in all geographical areas,” Osterholm says. Yet surveillance of H5N1 in poultry worldwide is patchy, particularly in poorer countries, where the virus is prevalent. It is also largely geared towards simply detecting and monitoring outbreaks, and few of the viral samples collected are ever sequenced. Moreover, if H5N1 surveillance in poultry is poor, the situation is far worse in pigs, where there is almost no systematic surveillance, even in richer countries. 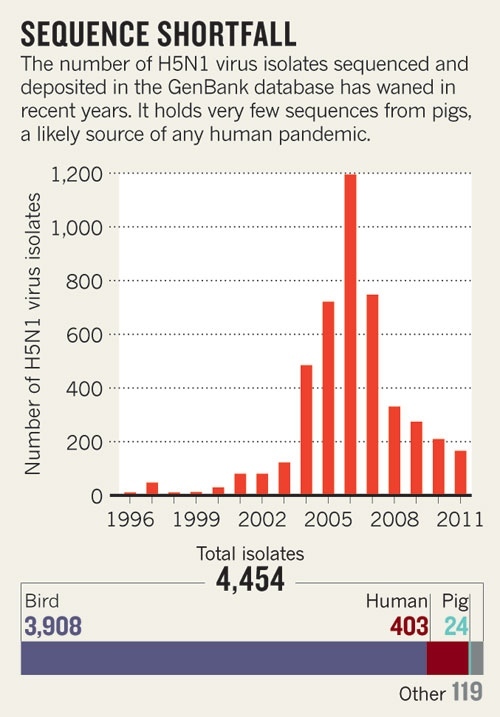 H5N1 infections in pigs are uncommon and cause only mild illness, creating little economic incentive to monitor them4. GenBank contains partial sequences from just 24 pig H5N1 isolates. Yet pigs are a likely source of a human pandemic H5N1 virus because they are susceptible to both human and avian viruses, creating opportunities for genetic reassortment in co-infected animals. But even if a candidate pandemic H5N1 virus was detected in poultry, culling flocks to eliminate it would be no mean feat. H5N1 has become endemic in many countries, including China, Vietnam, Indonesia, Bangladesh, India and Egypt, and the United Nations’ Food and Agriculture Organization estimates that, with current resources, it would take at least a decade to stamp out the virus in such countries. The relative ease of making H5N1 transmissible between mammals in the lab should now prompt the world to address these glaring inadequacies in surveillance, says Jeremy Farrar, director of the Oxford University Clinical Research Unit in Ho Chi Minh City, Vietnam. Molecular technologies need to be made more easily available and affordable to countries at risk, and genetic surveillance more comprehensive and timely. But building such systems would require sustained political will, financial resources, and overcoming major logistical hurdles in the field. Climate change alone cannot explain abrupt loss of rainforest 3,000 years ago, study suggests. Humans may have played a significant part in the sudden disappearance of rainforests from Central Africa, according to a study published online in Science. The work contradicts the prevailing view that the expansion of farming practices on the continent was made possible by the increased incidence of long, severe dry spells that destroyed vast tracts of rainforest. Geochemist Germain Bayon and his colleagues at the French Research Institute for Exploration of the Sea in Plouzané examined the weathering of sediment samples drawn from the mouth of the Congo River. 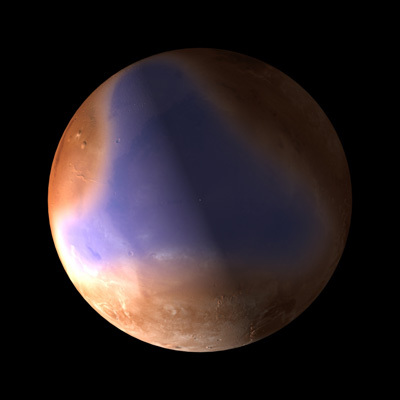 Because deforestation would intensify weathering, the clay samples provide, in effect, a continuous record of the climate for the past 40,000 years. When the researchers examined the sediment cores, they found that samples that were between 20,000 and 3,500 years old showed weathering that was consistent with the patterns of rainfall in the region. However, around 3,000 years ago, “there was a complete decoupling” between rainfall and the rate of weathering, Bayon says. The findings, he says, indicate that “climate could not be the only factor in explaining deforestation”. The team suggests that Bantu-speaking peoples from present-day Nigeria and Cameroon, known to have begun emigrating across Central Africa around 4,000 years ago, had “a significant impact on the rainforest” as they cleared land for farming and iron-smelting. Many researchers are sceptical that humans wielding crude implements could have destroyed such large areas of forest. Bayon says that the latest work does not necessarily contradict existing theories, but rather illustrates how the combination of culture and climate can affect the environment. “Humans can have a huge impact on natural processes,” he says. The study also raises important questions about the extent to which deforestation and other human activities may be exacerbating the effects of climate change, says David Harris, deputy director of science at the Royal Botanic Garden in Edinburgh, UK. “We need to be especially vigilant about what the present day human effects will be with logging, modern transport, groups displaced by conflict, and modern markets for food and other forest products,” he says. Next supercontinent will form over the Arctic Ocean. The current continents (left) are set one day to merge into the supercontinent Amasia (right), centred over the Arctic. In 50 million to 200 million years’ time, all of Earth’s current continents will be pushed together into a single landmass around the North Pole. That is the conclusion of an effort1 to model the slow movements of the continents over the next tens of millions of years. A supercontinent last formed 300 million years ago, when all the land masses grouped together on the equator as Pangaea, centred about where West Africa is now. After looking at the geology of mountain ranges around the world, geologists had assumed that the next supercontinent would form either in the same place as Pangaea, closing the Atlantic Ocean like an accordion, or on the other side of the world, in the middle of the current Pacific Ocean. But Ross Mitchell, a geologist at Yale University in New Haven, Connecticut, and his colleagues have a new idea. They analysed the magnetism of ancient rocks to work out their locations on the globe over time, and measured how the material under Earth’s crust, the mantle, moves the continents that float on its surface. 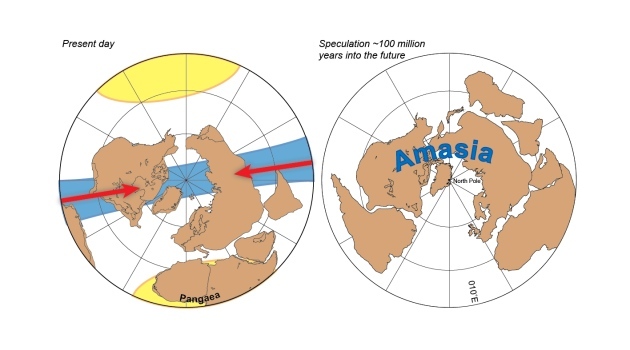 They found that instead of staying near the equator, the next supercontinent — dubbed Amasia — should form 90 degrees away from Pangaea, over the Arctic. Mitchell and his colleagues think that this is part of a pattern: Pangaea formed at about 90 degrees to the previous supercontinent, Rodinia, and Rodinia at about 90 degrees to Nuna, which existed around 2 billion years ago. They call this model orthoversion, as opposed to introversion — in which the supercontinent forms where Pangaea was — or extroversion, in which it moves round to the other side of the world, staying on the equator. Orthoversion helps to clear up a conundrum that has bothered geologists. They knew there had been supercontinents in the past, and that these land masses had a variety of configurations, “but we weren’t quite sure whether there was method in the madness as you went from one to the other,” says Peter Cawood, a geologist at St Andrews University, UK. Latest analyses from the Large Hadron Collider boosts case for particle. Today, the two main experiments at the Large Hadron Collider (LHC), the world’s most powerful particle accelerator, submitted the results of their latest analyses. The new papers boost the case for December’s announcement of a possible Higgs signal, but let’s not get too excited. oost their Higgs signal from 2.5 sigma to 3.1 sigma. Taken together with data from the other detector, ATLAS, Higgs’ overall signal now unofficially stands at about 4.3 sigma. In other words, if statistics are to be believed, then this signal has about a 99.996% chance of being right. 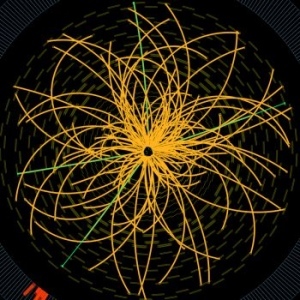 After the LHC starts again this spring, we’ll be much closer to knowing what’s actually going on. Right now, scientists are meeting in Chamonix, France, to decide at what power to run the collider this coming year. The latest rumours are that the machine will push from 7 to 8 teraelectronvolts, and it will also increase its luminosity (the number of collisions per pass). As every year Science Magazine and the National Science Foundation present the winners of the International Science and Engineering Visualization Challenge. A spider’s web catches flies. But the cosmic web depicted in the winning poster snares galaxies. Cosmologist Miguel Angel Aragon-Calvo of Johns Hopkins University in Baltimore, Maryland, and colleagues illustrate how an invisible network of matter creates space’s familiar features: “This poster is [intended] to show the relationship between galaxies and the environment where they live,” he says. Galaxies don’t grow out of nothing, Aragon-Calvo notes. Instead, their formation is decided by underlying but invisible accumulations of dark matter. Scientists suspect that this substance, which is still theoretical and remains impossible to observe, gives rise to most of the gravity in the universe. That gravity becomes the glue that holds galaxies together. So, in regions where dark matter is dense, galaxies begin to form, often grouping together in clusters or long walls. In their poster, which from top to bottom represents about 240 million light-years, Aragon-Calvo and colleagues simulate that process. 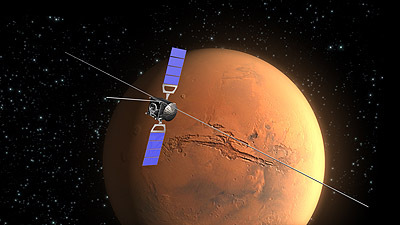 They explore the same patch of space from five different vantage points, traveling from the invisible to the visible. As the universe expands following the big bang, strings of dark matter condense along the edges of voids nearly tens of millions of light-years wide. These mostly empty regions of space can be seen at the far left of the poster (dark orange) bordered by bright filaments rich in matter. In the middle, weeping willow–like arcs follow the flow of matter over time. The lines converge at the present day, shown in red, and eventually spawn bright galaxies at the same points (far right). Depicting the entire “history of matter” in one poster is an ambitious task, but Aragon-Calvo hopes that viewers will come away with one message: “The universe has a rich structure.” Just like a spider web. Not all good science visualizations highlight the beauty of the natural world. Take this illustration by Ivan Konstantinov and colleagues at the Russia-based group Visual Science. His team drew on existing scientific information to depict the 3D structure of the Ebola virus, responsible for fatal outbreaks of hemorrhagic fever throughout much of Africa. This virus, only 1400 nanometers in length, is no simple pathogen, Konstantinov says. His group previously patched together a similar 3D model of HIV. But Ebola is nearly 10 times larger, containing roughly 3 million lipids and protein molecules. The poster, too, provides a good look at how Ebola turns dangerous. Proteins coded by the virus’s own genome are shown here in maroon. They’re the pathogen’s Velcro, clinging to the surface of target cells and giving the virus access to their interior. Anyone perusing this poster “can clearly understand that the Ebola virion is a very complex supramolecular structure, with various polypeptides, lipids, and RNA genome included,” Konstantinov says. Not exactly the stuff of an Ansel Adams photograph, but an eye-catching sight nevertheless. For anyone who’s ever wanted to take apart a microscope to see how it works, this is the poster for you. Here, scientists at the National Institute of Allergy and Infectious Diseases Integrated Research Facility (IRF) in Frederick, Maryland, dismantle a transmission electron microscope (TEM) piece by piece—all without damaging expensive lab equipment. These instruments bombard tiny objects such as viruses or proteins with beams of electrons, capturing images too small for conventional light microscopes. In their dissection, Fabian de Kok-Mercado and colleagues at IRF delve into deeper and deeper detail, moving from left to right. The researchers first display a TEM in its entirety. Then they follow the visualization tool down to its cryo-device (at right), which keeps organic samples cool for maximum clarity. In between, viewers themselves can track the formation of an electron beam from start to finish. It begins at the electron gun that creates the free particles using an electric current, then continues through a handful of lenses that condense, focus, and magnify the output. It’s the ideal schematic for technology junkies who like to think small.